Every year or two a calf is born in the Kiawah River though an actual birth has never been witnessed. The infant mortality rate for dolphins is very high though impossible to scientifically determine in wild populations. In captive populations it is as high as 50% and is assumed to be equally high in the wild. This year a new calf appeared in the Kiawah River and is reported to be doing well. Marine parks and aquariums have the advantage of being able to witness births and provide care for the new born calves. 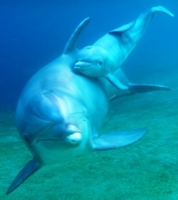 Recently a calf was born at Dolphin Quest Hawaii. They were able to get an incredible video of the actual birth (click for link to their website and video).